Caloundra Central Apartment Hotel is central to everything on the vibrant Sunshine Coast, including some of Australia's best surf beaches; Currimundi, Kings, Moffat and Dicky beaches are only minutes away. This resort is ideal for family holidays, romantic getaways and corporate travellers. Choose from large luxury studio, one, two and three bedroom apartments that offer free: Wi-Fi, Foxtel, and secure undercover parking. Apartments are elegantly furnished and have fully equipped kitchens and large flat screen televisions. 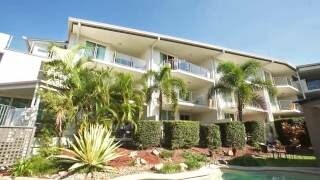 Apartments also have a large entertainer balcony overlooking the pools and tropical gardens. Most importantly, all apartments are home-sized with plenty of room to stretch out. Guests may choose to dine at the elegant in-house restaurant and bar. Alternatively, there is an array of eateries and shops only minutes away. This resort offers two refreshing swimming pools as well as a heated spa pool, a barbecue area and lush tropical gardens. Luxury three bedroom apartment that can accommodate up to six guests with two Queen Size Beds and two Single Beds. It also features a large entertainer balcony, living and dining areas and fully equipped kitchen and laundry. All guests enjoy free: continental breakfast, Wi-Fi, Foxtel and secure undercover parking. Executive Motel Suite with a Queen Bed or Twin Singles, bathroom and kitchenette including toaster, microwave, kettle and bar fridge. (No balcony). All guests enjoy free: continental breakfast, Wi-Fi, Foxteland secure undercover parking. Spacious one bedroom apartment with lounge and dining area, large entertainer balcony and fully equipped kitchen and laundry. Two Bedroom Apartment that accommodate up to four guests. Apartment includes either two Queen Sized Bed or one Queen Size Bed and Twin Singles. Spacious living and dining area, entertainer balcony and fully equipped kitchen and laundry.